In sharp contrast with the small, entry-level CE, is this DER/S, the large format calculator with an extra memory register with item counter. 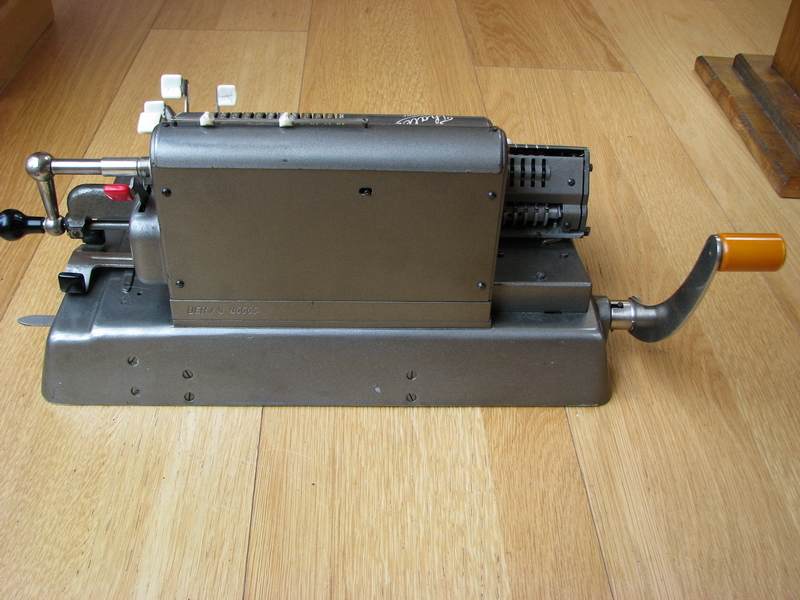 The advantage of this machine over the much earlier CES is that it also is equipped with full back-transfer functionality, which will be demonstrated later. It is an impressive behemoth of a machine. When I got it, it was blocked, and when freed up, it turned out to have large troubles with the tens carry in the extra memory register, as well as with the item counter in the memory. 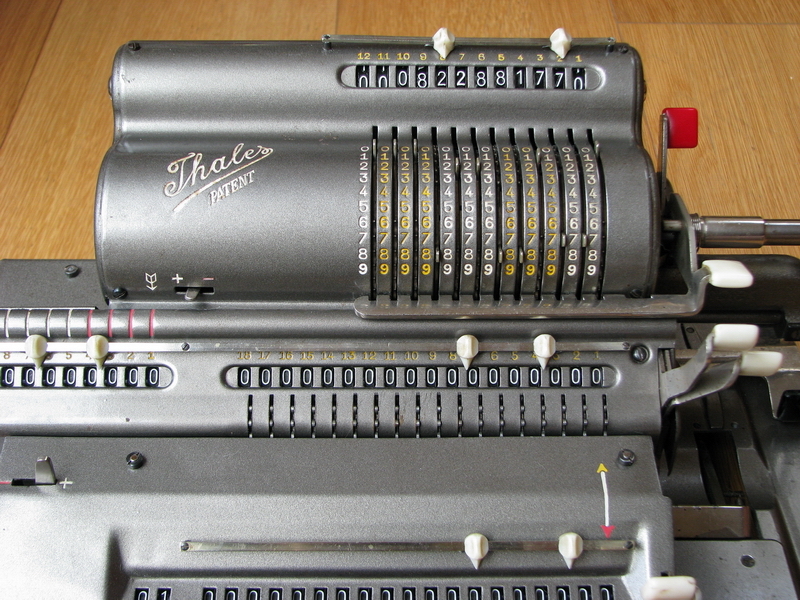 In the older CES, tens carry is effected quite similarly to the tens carry in the counter register in earlier Thales machines - with a cylinder with pins that are movable sideways, and click the next counter wheel to the following position when the tens carry preparation lever has been operated by the previous counter wheel. In the case of the CES, the cylinder is mounted in the base of the machine, under the register, and there are a number of intermediate gears. 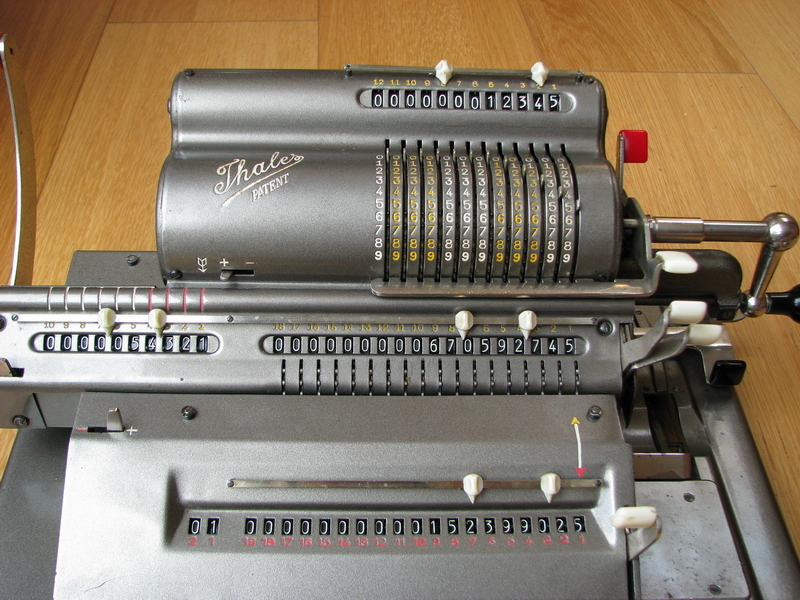 Here, there still is a cylinder, but it has very large, fixed pins, and tens carry is completed by a nightmarish set of levers, that remind me of the equally nightmarish insides of a Comptometer. 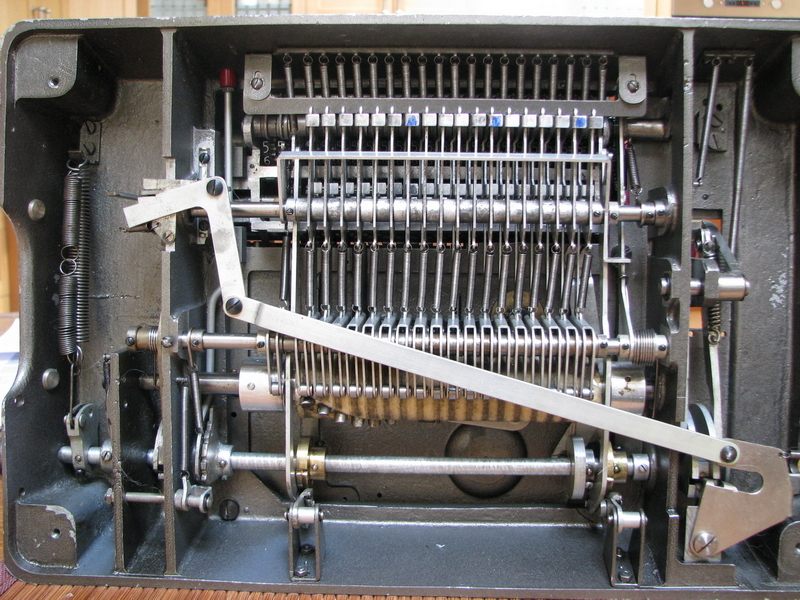 The set up for the tens carry is done by one particular lever moving slightly downward, making another spring-operated lever hook into place behind it. 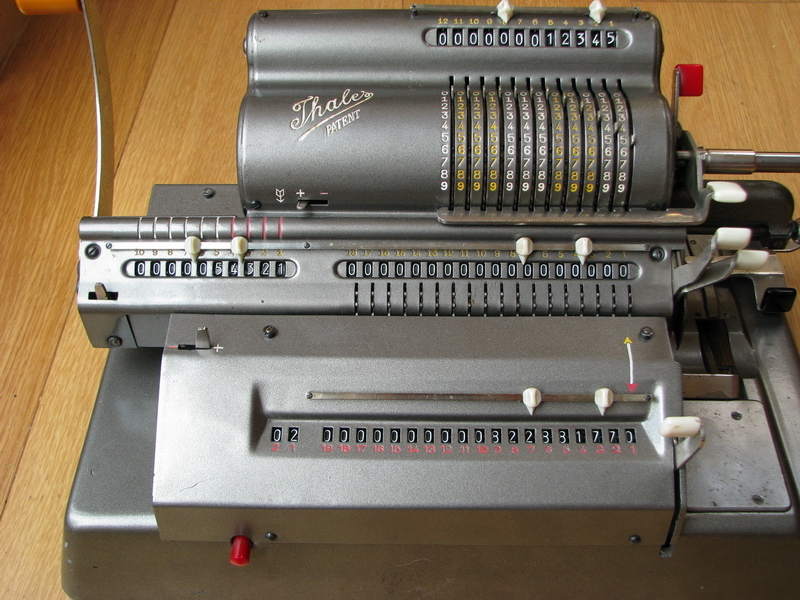 And there is the problem - if these spring-operated levers are not absolutely free of friction, they will refuse to click into place fast enough to effect the tens carry to the next decade, quite similarly to the situation in the setting register of the Marchant geared sector machines. 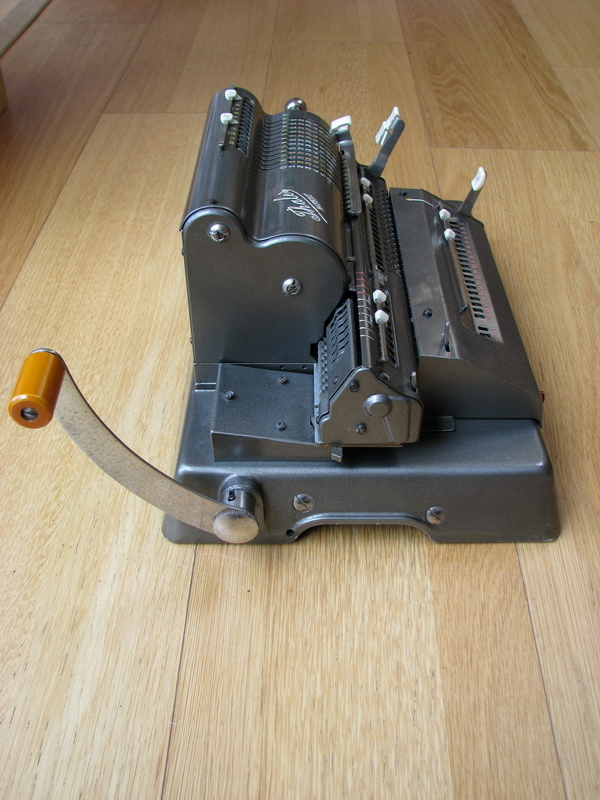 Copious oiling did improve the situation, but did not solve the problem entirely, as the rod the levers pivot on cannot be entirely removed from the machine without major disassembly. This makes the calculator useless in practice - it appears to function beautifully, but will miscalculate in the memory register. 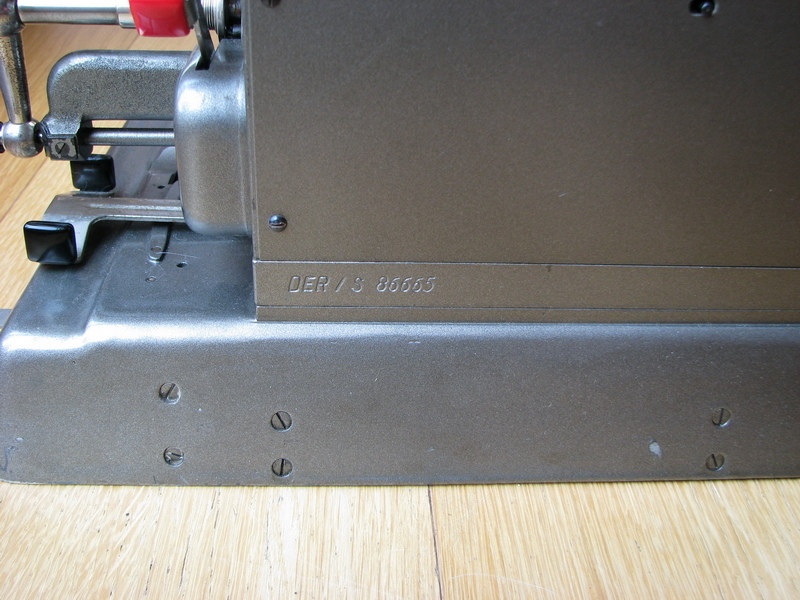 This is a picture of the bottom of the machine, with the cover plate off. 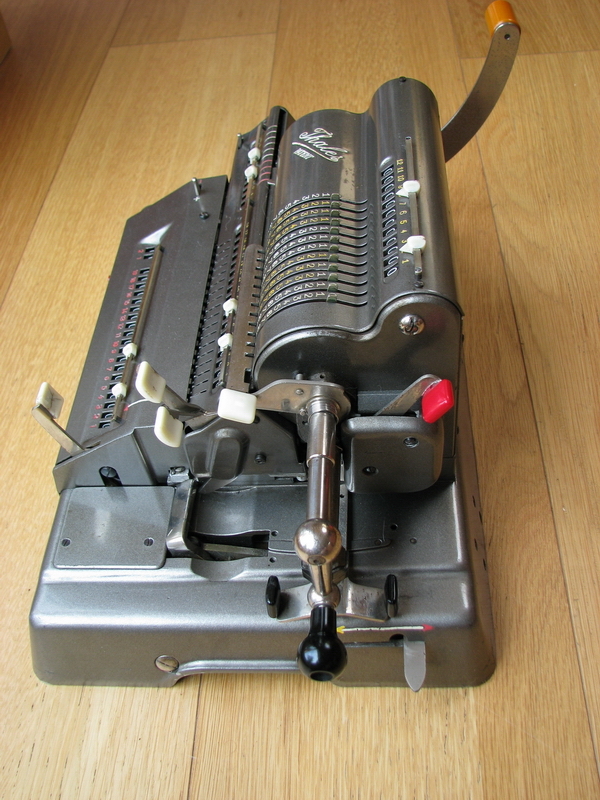 You can see the felt-clad cylinder at the bottom, behind the diagonal steel strip, and the rest of what is to the front of the machine is the lever system for tens' carry. Three of the preparation levers are colored blue, those were the problematic ones. The bars behind them should click to the front and hook them into position, driven by the bank of springs on the other side of the horizontal axis they pivot on, below in this picture. This pivoting action is the problem. 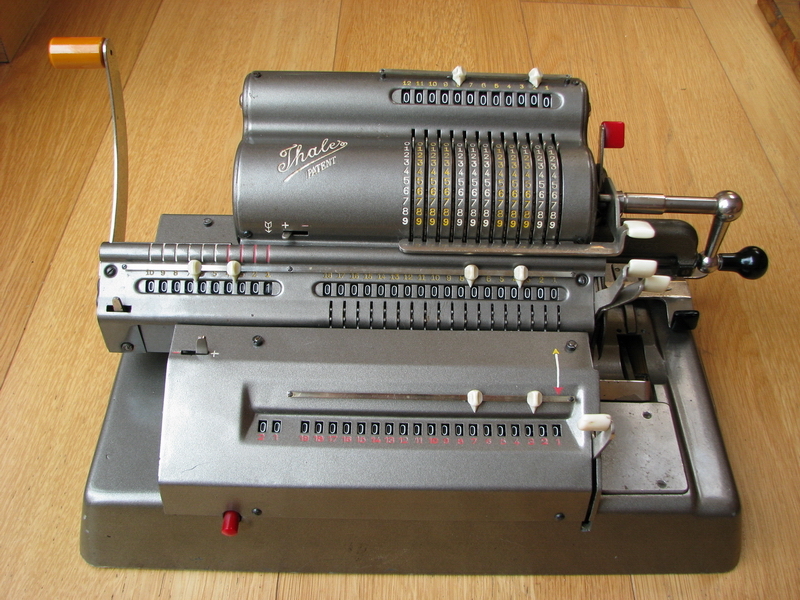 Now we will demonstrate a simple calculation, and set up the machine with 12345 in the setting register. 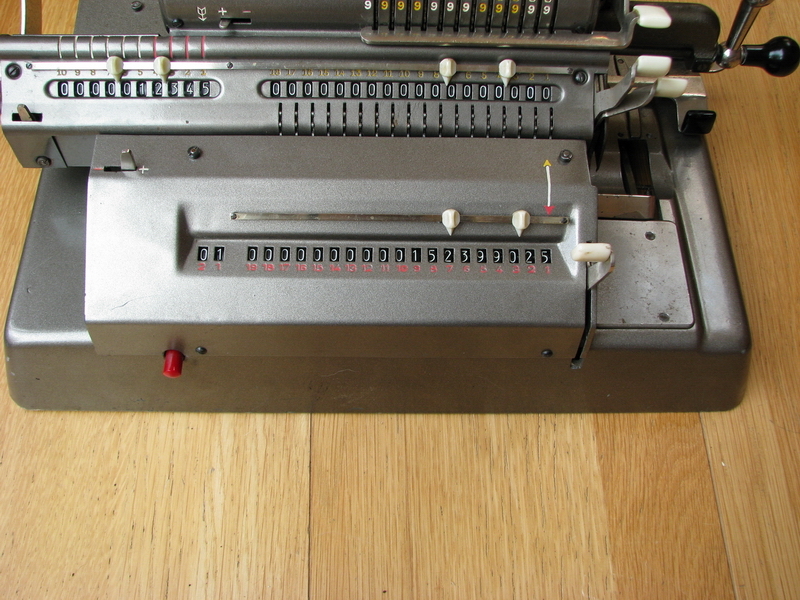 This is transferred to the memory register by pulling the large lever on the left. 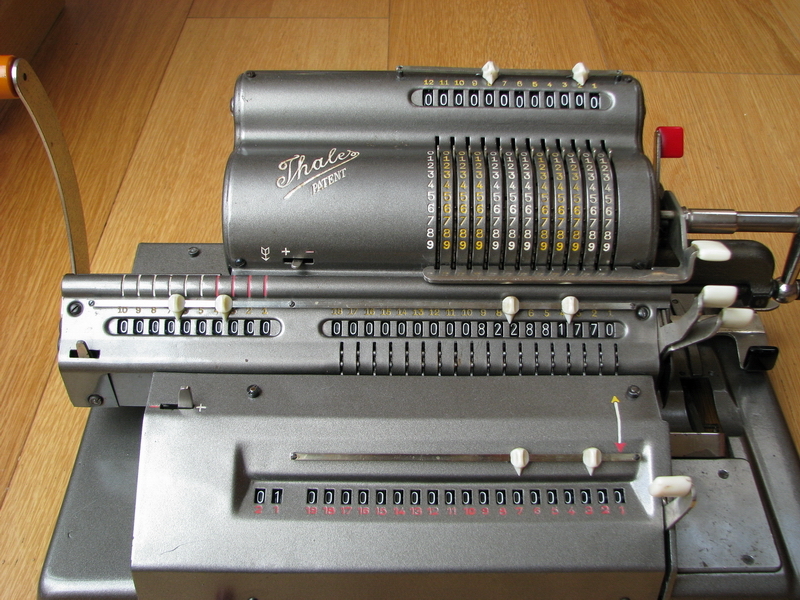 The item counter at the left of the memory register increases by 1, and the result register is cleared. 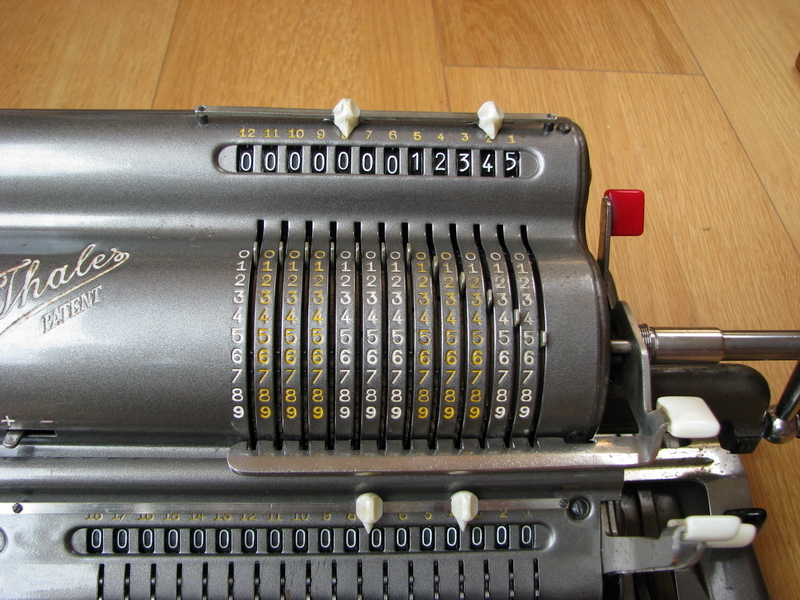 By pulling the large lever, we add this to the number in the memory, and the problems with tens carry become clear - the result should be 822991770, but the register reads 822881770. The item counter did go up to 2. Note that the item counter went back down by one unit by doing this. As soon as we have the number in the result register, we can also transfer it back in the usual way to the setting register - the input is cleared, the red lever pulled to the front and held, and then the result register is cleared, which effects the transfer back to the input. There is one more buttom which has not yet been discussed, and that is the small red button at the front of the base. This served to unblock the ratchet associated with the large transfer lever, if for some reason it needs to be returned mid-operation because something went wrong in the machine. It is telling that the button exists - the transfer was probably never entirely without its problems. 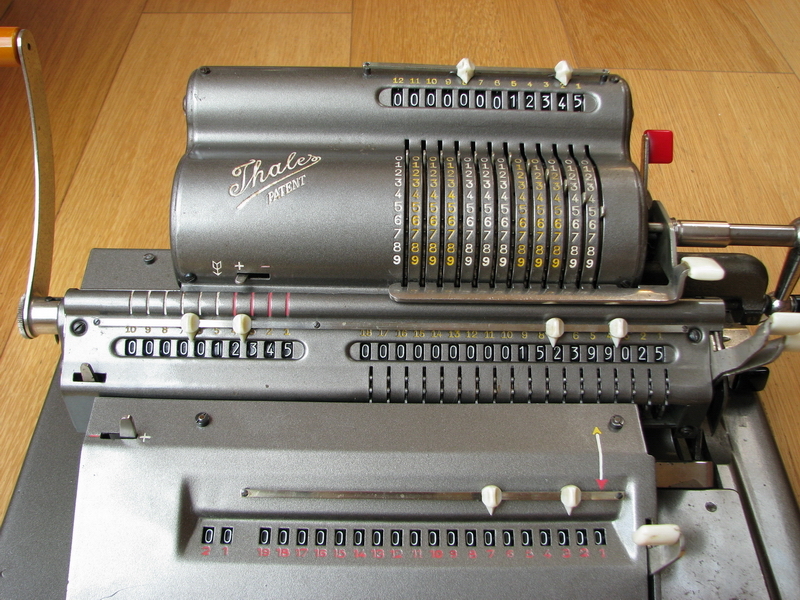 All in all, this is the most versatile Thales machines in existence - it can do everything but print. It is however obvious that not many have been sold, because today, they are rare as hens' teeth.